How often should my dog see the veterinarian? Since dogs age at a faster rate than humans, they should see their doctor more often than we see ours. Sometimes people equate one year of a dog’s life to 7 human years but this is an oversimplification. In fact, one calendar year for a dog may equal anywhere between 4-15 human years due to the way dogs mature. Pups mature very fast during the first year of life and are considered to be teenagers (15 years old) after only 12 months! By their second birthday, they are actually about 25 years old. After that, the aging rate slows down so a dog ages about 4-5 years for each calendar year with large breeds aging more quickly than smaller breeds. The bottom line is this: Dogs age faster than we do. If we get a physical exam and blood tests annually, that would be like our dogs taking the same preventive health measures every 4-5 years. The rapid aging process of dogs makes preventive health care even more important. What are the preventative health care guidelines? Here is an overview of some of the AAHA, AVMA recommendations for preventive care and why they are important to your dog. History: A discussion of your dog’s home life will give your veterinarian an overall idea of his health status. Changes in your dog’s demeanor may occur so gradually that you aren’t aware of them until you are asked specific questions. Does your dog have a good appetite and regular bowel movements? Does he strain to urinate? Does he limp? Is he slow to rise when lying down? Does he ever cough, sneeze, or seem short of breath? Is he itchy? Does he drink a lot? Your answers will guide the veterinarian along a diagnostic path that will end with your dog feeling better. 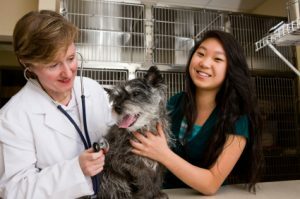 Examinations: Even healthy dogs should be examined by a veterinarian at least once a year, preferably twice. If your dog is older or has medical problems, more frequent visits may be necessary. Physical exams can detect heart murmurs or skipped beats that require a full cardiac work up, enlarged lymph nodes, skin tumors, or abdominal masses that may indicate cancer, enlarged or shrunken kidneys, liver, or spleen that may mean systemic disease. A look at the eyes can determine a dog’s visual capacity. An orthopedic evaluation can tell if a dog is arthritic and in need of pain medication. A dermatologic evaluation of the hair coat will determine the need for flea and tick control or diagnose skin infections (bacterial, fungal, parasitic). Hair loss may indicate systemic disease or hormonal imbalances. Testing: Although heartworms are more prevalent in warmer climates where mosquitoes thrive, infected dogs live in every state. Even dogs in cold environments can get heartworms, so The American Heartworm Society advises annual heartworm blood testing. In our area ticks are very prevalent, so we recommend screening for tick-borne diseases like Lyme Disease or Ehrlichia. Our 4DX screens for 5 tick born disease and heartworm disease. All dogs should be screened annually as vaccines are not available for all the tick-borne diseases. Intestinal parasites can affect both dogs and humans, so a stool sample should be analyzed at least once (preferably twice) a year. To diagnose organ malfunctions in the early stages, blood tests (CBC, chemistry panel, thyroid screen) and urinalysis should be performed annually. If problems are diagnosed, more frequent testing may be necessary. Dental Care: It’s a well known fact that oral health impacts a dog’s general health. Simply put, dogs with clean mouths live longer. The bacteria involved in periodontal disease don’t just stay in the mouth. These organisms invade the blood stream and travel to major organs like the kidneys and heart where they cause significant health issues. Dogs usually need a dental cleaning once yearly, but certain breeds predisposed to periodontal disease and aged dogs may need their teeth cleaned twice yearly like people do. Dental radiographs will help determine the status of oral disease. Regular dental cleanings will also allow your dog to keep his pearly whites in good condition. Parasite Prevention: Dogs should be given medication to prevent heartworms all year long. Many heartworm medications also prevent or treat intestinal parasites. Flea and tick prevention is also very important. A parasite prevention protocol can be tailored to a dog’s specific needs within his personal environment. Immunizations: Vaccinations are divided into two groups: core vaccines and optional vaccines. All dogs (without medical problems that preclude immunization) should receive vaccinations for rabies, distemper, canine parvovirus, and canine adenovirus-2 (hepatitis). Vaccination for kennel cough, leptospirosis, Lyme disease and canine influenza may be recommended for dogs with potential exposure to these diseases. Weight Maintenance: Research has shown that leaner dogs live longer and have fewer health problems. Your veterinarian will assign a body condition score to your dog and give you dietary and exercise recommendations to help your dog maintain a healthy body condition score. Since dogs cannot talk, veterinarians can’t ask them how they are feeling or what’s bothering them. Plus, innate survival instincts make dogs hide illnesses so they won’t appear weak or vulnerable to predators. That means thorough physical exams are crucial to keep dogs healthy. And since your veterinarian can’t see what’s going on inside a dog’s body, blood and urine tests are needed to complete the health picture. These preventive medicine steps will diagnose problems earlier making treatment more successful and less costly and, more importantly, can help your dog live a longer, healthier life.